The paint was made originally at the S-W Granville, MI plant and is no longer stocked. The Portland plant got the formula from Granville and can mix some up for me. The cost will be in the neighborhood of $100/gal plus shipping (they are to get back to me on the final cost). If anyone would like to add to my order of a gallon they can contact me. You could also order direct from Sheryl at the Portland S-W plant (ph 503-249-0222) or possibly your local S-W plant can make it up as well. The S-W part number is L61-XXG-5733-4331 (Opex laquer). I hope this helps someone out. I used Benjamin Moore Low Lustre Metal & Wood Enamel IronClad Alkyd Deep Base C163 3B. 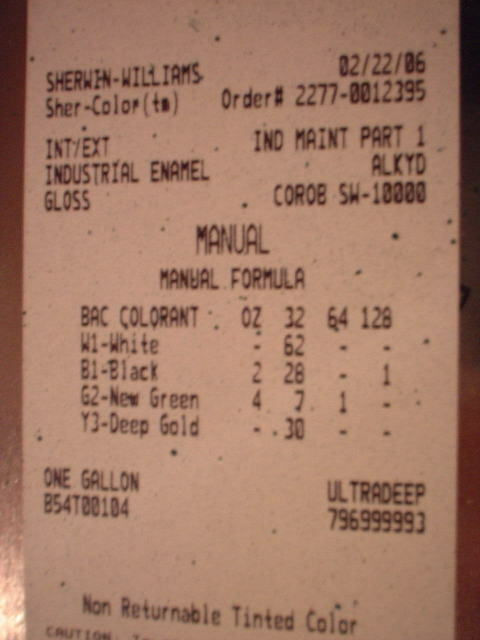 With a color code of OY 4x 28.00, BK 4x 0.00, BB 3x 16.00, TG 0x 4.00. My machine was pretty faded, but the cover to the wires coming out of the motor wasn't exposed to light so I had them match it to that. That cover had been covered by grease for probably most of it's life as the motor bearing empties out in that cavity. So this color might be darker from that, but it looks good. I matched my color to an existing piece of factory paint on my planer and it was a long process. The paint store did not get it that this was something that I wanted to do over and over. Even after promising me they would keep the formula on file, they didnt. So the next machine we had to repeat this process. The color of my formula actually shifted a little during that chaos so it is not perfect dead on but very very close. We use a DuPont Centari Acrylic Enamel we get from an automotive supplier and it is awesome. That is from the inside of the label.